Bengaluru City Police has appealed to protestors in the state to maintain calm and desist from destroying public and private property, after almost 30 buses were torched during the demonstrations today in a bus depot, amid protests in the wake of Cauvery water dispute. Meanwhile, KSRP and Quick Reaction Teams have been deployed all over the city to check violence, which have escalated. According to reports, over 200 protestors have been detained so far. The Bengaluru Police today imposed Section 144 of the CRPC from 5 p.m. onwards, meaning that no more than five people will be allowed to gather in public places in the city. 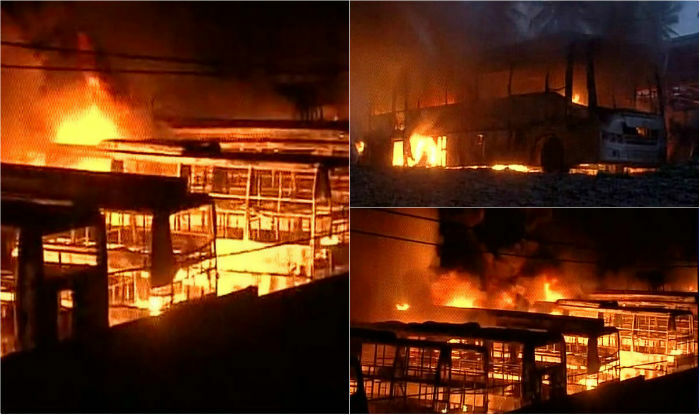 Massive violence broke out today in parts of the city as several trucks, school buses and bus stands were seen being set on fire by the pro-Kannada protestors in West Bengaluru. This afternoon, protesters targeted vehicles bearing Tamil Nadu registration numbers and set them on fire. They also vandalised trucks near Hubli bypass in Karnataka. The Bengaluru Police have appealed for calm and urged the people not to pay heed to rumours. Around 270 police patrol vehicles have been deployed across the city in the wake of the protests, said city police. Meanwhile, saying “we will fight it legally”, Karnataka Home Minister G Parameshwara has requested pro-Kannada activists and farmers associations to maintain peace. “Our appeal is if you are protesting, please protest peacefully. We know that injustice has been done to Karnataka. We have deployed sufficient amount of police force. We have got support from Centre,” Parameshwara said. He also informed that 10 companies of CRPF and the Rapid Action Force (RAF) have been sent. “We have also requested for 10 more companies from the Centre. Tomorrow at 11:30 a.m. Karnataka Chief Minister Siddaramaiah has called emergency Cabinet meet to discuss Cauvery issue,” he said. Bus services running from Bengaluru to Tamil Nadu were temporarily suspended in the day as pro-Kannada activists vandalised shops at the bus station. Metro services resumed in the city after 20 minutes of suspension. Following fresh protests, maximum schools in the city were closed or asked to shut down early today. Bus services (Bangalore Metropolitan Transport Corporation) from Bengaluru to Tamil Nadu have been temporarily suspended from the city. Incidents of stones pelting were reported at a Karnataka Bank branch in Chennai’s Anna Nagar. There were reports of some shops and Tamil Nadu registration cars being vandalised. A number of stores and markets in parts of the city downed their shutters as a precautionary measure. There were reports of crowds stopping Tamil Nadu registered vehicles at Whitefield in Bengaluru. Siddaramaiah has also appealed for peace and has written to his counterpart in Tamil Nadu, Jayalalithaa, urging her to ensure the safety of Kannada speaking people living in the state. He also urged the Tamil Nadu authorities to take action against those indulging in violence. A group of pro-Tamil activists attacked the New Woodlands Hotel in Chennai over the ongoing Cauvery water row between Tamil Nadu and Karnataka in the wee hours. The RAF and at least 15,000 police personnel have been deployed in large number across the city to control the violence as Cauvery water tension escalated between Karnataka and Tamil Nadu after the Supreme Court’s latest verdict today. Modifying its September 5 order, the apex court today asked the Government of Karnataka to release to release 12000 cusecs of Cauvery River water every day to Tamil Nadu till September 20. It had earlier directed the Government of Karnataka to release of 15,000 cusecs of water for 10 days as immediate relief to farmers in Tamil Nadu.